Project SEARCH at Ascension Seton offers an innovative approach to employment for individuals with intellectual disabilities. Through individualized internships focused on filling a business need, Project SEARCH provides each participant the opportunity to develop vocational skills and build professional experience with the ultimate goal of competitive employment. 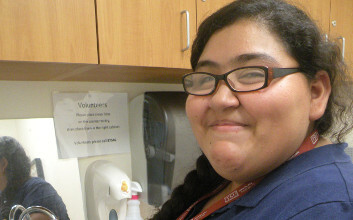 See how Project SEARCH interns are improving patient care and advancing their own job skills. 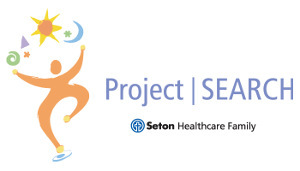 Learn more about Project SEARCH at Ascension Seton by watching our short overview video. Learn about our internships and hear how Project SEARCH helps graduates, their families, and the people we serve. Project SEARCH received the 2014 Living the Mission and Values Award from Ascension, the parent company of Ascension Seton and the largest nonprofit healthcare system in the United States. The Governor’s Committee on People with Disabilities recognized Ascension Seton with the statewide 2009 Large Employer Award for its innovative practices in hiring individuals with intellectual disabilities through Project SEARCH. 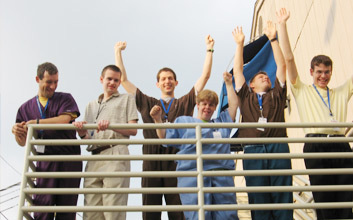 Additionally, the Austin Mayor’s Committee on People with Disabilities honored Project SEARCH at Ascension Seton the following year with their 2010 Large Employer Award. Ascension Seton was recognized as the 2008 Health Care Heroes Employer/Business Leader by the Austin Business Journal for its work with Project SEARCH at Ascension Seton Medical Center Austin. The Project SEARCH model received the 2004 New Freedom Initiative Award from the United States Department of Labor for exemplary and innovative efforts in furthering the employment of people with disabilities. The work and the accomplishments of Project SEARCH are a vital extension of Ascension Ascension Seton’s mission and values. We believe each person is a sign of God and endowed with dignity. We embrace the diversity of each individual, the practice of inclusion and the respect for individual needs that are at the core of what the Ascension Seton experience is all about.